What I look for in a bow is very simple; Does the bow feel good in your hands? Does the bow feel good after the shot? Does the bow improve your accuracy (even if your form is less than perfect)? And above all, do you enjoy shooting the bow? I've now spent nearly a month with the Mathews Halon 32 and can honestly answer "yes" to those questions. The Halon 32 is built on the same frame and general physics of the 2016 Halon - however the Halon 32 grew a little - it is now 32 inches' axle to axle. All the rage these days is for shorter and shorter bows. A short axle to axle create more nock pinch due to the sharp string angle. Mathews has obviously listened to that feedback when they designed the Halon 32 - and I welcomed this change. The brace height options are the same (5', 6', 7') on the Halon 32 it's just the Axle to Axle length that's changed. 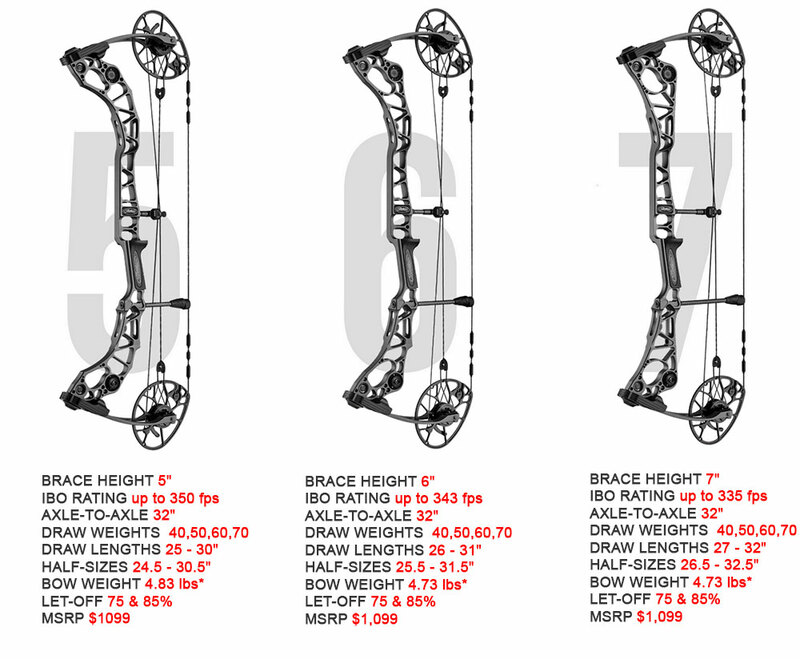 While the bow has gotten taller, the weight has basically stayed the same. It weighs in at 4.73 lbs for the Halon 6, and 7 and 4.83 for the Halon 5. For speeds, we're looking at a very slight decrease in IBO speeds on the Halon 32 from the original Halon. With 350 fps on the Halon 5, 343 fps on the Halon 6, and 335 on the Halon 7. Just like with last year's Halon, the Halon 32 uses the Crosscentric cams for perfectly level nock travel. 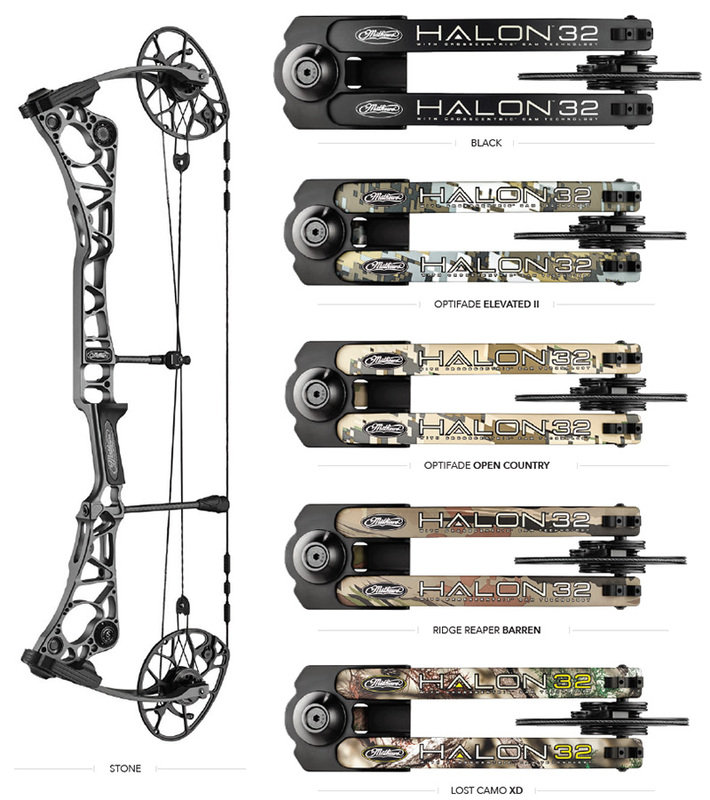 Mathews has added some new camo options with the 2017 Halon 32. First is the addition of Sitka's Optifade pattern - both in Elevated 2 and the Open Country pattern. They also added Under Armour's Ridge Reaper Barren pattern, along with Mathews' popular Lost Camo XD. You can also get the bow in solid colors as well. The bow shot fantastic for me - particularly with broadheads. If you like the Halon, you'll love the Halon 32. I found a slight improvement in balance and hand shock due to the extra length of this bow. Back wall and hand-shock remained outstanding and consistent with the 2016 Halon. Arrow flight was fantastic - due to the level nock travel and forgiveness of the bow. This bow rocks. I like that Mathews stretched it out. I love the new camo options like this Sitka Elevated 2 pattern, and I like the fact that Mathews kept all the great features from the Halon and added just enough to make it a little bit better. Of course, we always urge every person reading these reviews to go and try it yourself. Bows are a very personal decision and what one hunter likes another may not. But it's safe to say that if you're looking for a new bow - the Mathews Halon 32 should be on every hunter's short list!